About 2 months ago I was browsing through a social media site (honestly, I can't remember which one) and saw a post from my favorite running store about recruiting volunteers to participate in a product study. 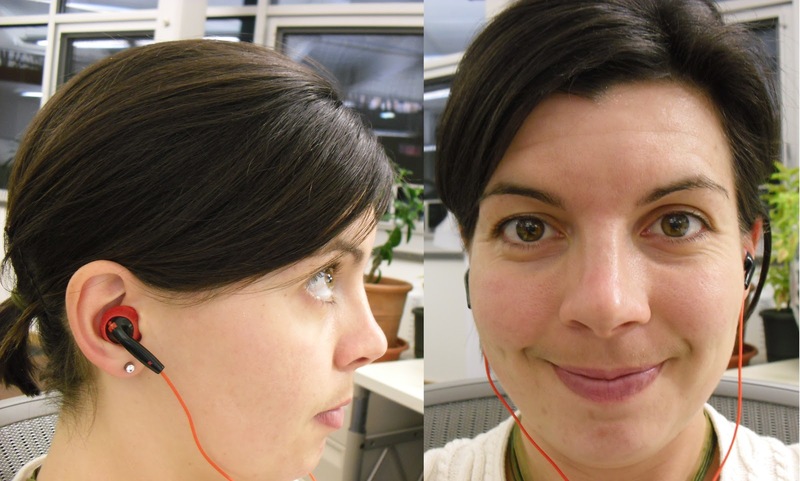 The product was Yurbuds, and participants would be asked to submit to an interview, then real-life product testing and a follow-up conversation. In exchange, we would be offered a gift card to Big River Running. Sounded like a good deal to me and I called the number immediately and left a message. A few hours later, Ken at Fred Sparks called me back to schedule an interview. I'm in! Sweet! I visited the Fred Sparks offices a few days later to answer some questions. They first wanted to hear about my normal athletic training habits (um yeah....where do I start...). Then they placed two boxes on the table in front of me: one Ironman Inspire and one Ironman Endure. (Then we talked about what my reactions would be if I saw these items in a store, how I would evaluate them, how I interpreted the packaging, and eventually which one I would purchase. I chose the Ironman Inspire because I have used other brands of behind-the-ear headphones like the Endure and didn't really care for them. Then, they asked me to open the Inspire package like I would if I had purchased it and brought it home. We discussed my reaction to the package contents and my first impressions of the product. The entire conversation was recorded on video and audio. It was a little intimidating since I have never been exposed to the inner workings of the marketing industry, but I did my best and tried to be honest. At the end of the interview, I was instructed to take the Ironman Inspire yurbuds home with me and use them in my workouts for the next week. 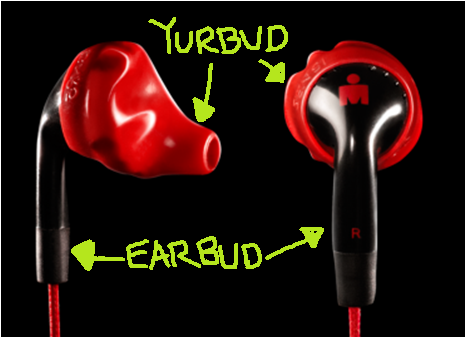 One point of clarification - I consider the yurbud itself to be the silicone funnel-shaped tip that fits ONTO earbuds. To my understanding, all of the product sold in stores includes both the yurbuds and a pair of earbud-style headphones. The yurbuds are removeable and it seems like they would fit on just about any brand of in-ear style headphone. My Ironman Inspire yurbuds came with me on 2 runs, 3 bike rides, 1 lifting session, and a few car trips (side note: my car does not have a stereo, so on long journeys I use headphones. That might be illegal...). Overall, I really enjoyed using the yurbuds and I have continued to use them after the "trial period" finished. I think they shine the brightest in activities where you want to discourage/block outside noise. 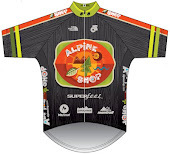 In my life, this meant I enjoyed them the most in the gym and on my mountain bike. In the gym, the silicone yurbuds do a GREAT job of cutting out extraneous noise like generic TV channels, background music, old guys' grunting, etc. This helps me focus on MY workout instead of getting distracted by the latest political rant. In the great outdoors, the yurbuds deliver music much more effectively than a regular earbud alone. I proved this to myself by doing a 40-minute run, the first 20 minutes with the yurbuds and the last 20 minutes with just the earbuds. In the last 20 minutes (without the yurbuds), I had to crank the volume up on my iPod and still couldn't really hear my music with the same clarity as WITH the yurbuds. In my former life, I was a model. Can you tell? I also used the yurbuds while road biking, and they worked TOO well. I felt they blocked out the background street noise to a degree that decreased my situational awareness and was dangerous. I experienced the same feeling to a lesser degree while running. Since I use headphones only when I run alone, it would be only too easy to start jamming out to my tunes instead of paying attention to other people on the street - other people that might not have my best intentions at heart. So, please, use your yurbuds in appropriate situations only! All set for tonight's workout!